Austrian architect; born in Vienna Oct. 15, 1842. He was graduated from the Vienna Polytechnic in 1861, and thereupon studied for five years at the Academy of Fine Arts under Professors Van der Nüll, von Siccardsburg, Rösner, and Dombaumeister Schmid. In 1862 Stiassny, with the assistance of a few of his colleagues from the academy, founded the "WienerBauhütte," which still exists, and of which he was president for a number of years. In 1867 Stiassny was appointed delegate to the Paris Exposition by the Ministry of Commerce, and in the following year he settled in Vienna as an architect. 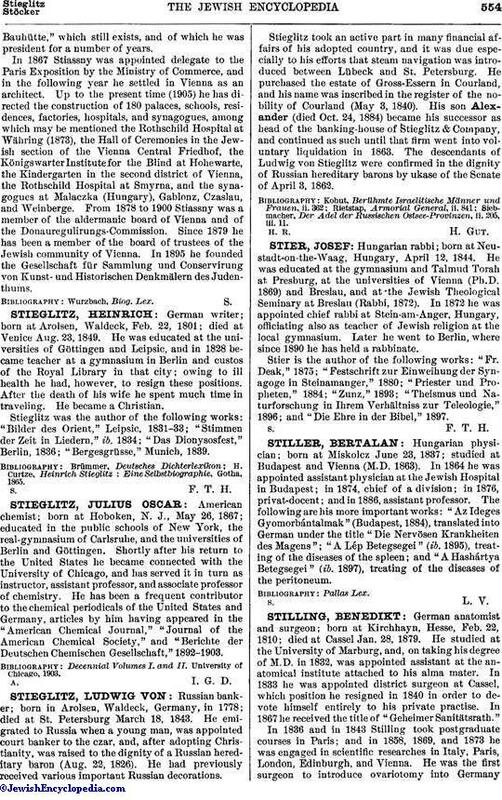 Up to the present time (1905) he has directed the construction of 180 palaces, schools, residences, factories, hospitals, and synagogues, among which may be mentioned the Rothschild Hospital at Währing (1873), the Hall of Ceremonies in the Jewish section of the Vienna Central Friedhof, the Königswarter Institute for the Blind at Hohewarte, the Kindergarten in the second district of Vienna, the Rothschild Hospital at Smyrna, and the synagogues at Malaczka (Hungary), Gablonz, Czaslau, and Weinberge. 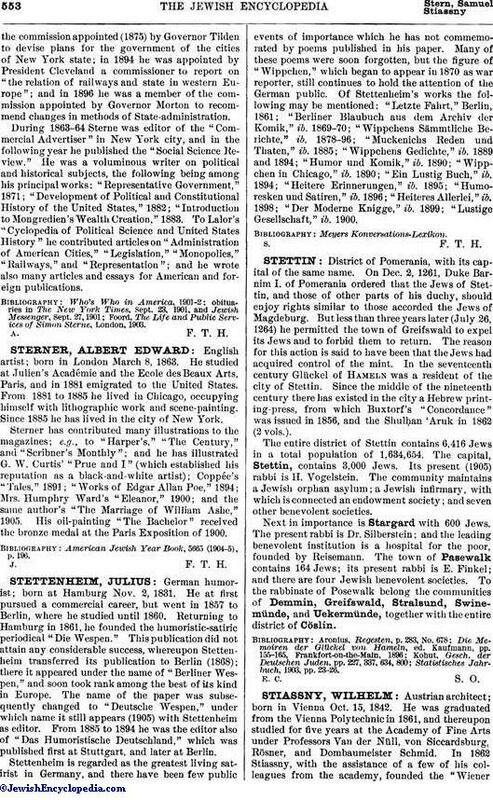 From 1878 to 1900 Stiassny was a member of the aldermanic board of Vienna and of the Donauregulirungs-Commission. Since 1879 he has been a member of the board of trustees of the Jewish community of Vienna. In 1895 he founded the Gesellschaft für Sammlung und Conservirung von Kunst- und Historischen Denkmälern des Judenthums.